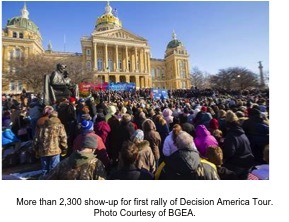 Tuesday, Graham stood on the steps of the state capitol building in Des Moines, Iowa, to kick-off the first of a series of noon rallies to be held in every state called the Decision America Tour. Each rally will feature Graham as speaker, moments of corporate prayer, and encouragement for Christians to engage the political process in educating themselves on the issues and candidates, voting their Christian values, and running for public office. Graham says he’s not going to endorse any candidates at the rallies. Just before Christmas, the son of the famous evangelist, Dr. Billy Graham, said he was frustrated with both political parties and was leaving the Republican Party to become an Independent. During the rally in Des Moines, Graham referred to his father, whom he said is now 97 years-old and doesn’t travel anymore. He said his father’s ministry was no longer preaching but a ministry of prayer. Graham said the reason people had come to the rally was for the same – to pray. “We are also here because we understand our country is in trouble. It’s in big-time trouble,” said Graham. “We’re in trouble spiritually. We’re in trouble racially…We have economic problems. We have political problems. And no political party is going to be able to turn this around. I have no hope in the Democratic Party. I have zero hope in the Republican Party. I have no hope in Tea Party or any other party. My only hope is in Almighty God and his son, Jesus Christ,” Graham said to much cheers and applause. Preaching from the Old Testament book of Nehemiah, Graham argued that like Jerusalem of ancient days, America’s walls and gates were down. After leading rally participants in moments of corporate prayer focused on confession of personal and corporate sin, as well as the sins of the nation’s fathers, the evangelist further spoke about the plight of America and what could be done to prevent the nation from failing. Some people have asked the younger Graham, what his father would do if he were in his shoes. Graham answered that question by providing some quotes from his father. 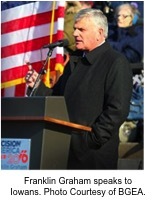 Franklin Graham then urged Christians to form prayer groups to pray regularly for the country. From these groups, he urged them to recruit Christians to run for office, organize, and campaign for them, as well as get out the Christian vote. “America needs the Christian vote,” he declared. public, and with their vote. The pledge included a commitment by attendants to pray fervently for the nation, register and vote, and engage their communities with God’s truth and prayerfully consider running for office. The Decision America Tour will make its next stop in Baton Rouge, Louisiana. The tour is not scheduled to make the Tar Heel state until October.